Time is running out to save the world. But as the class grows closer to Koro Sensei, the decision to take him out becomes more difficult. Though for some, it may not be that hard of a choice after all. 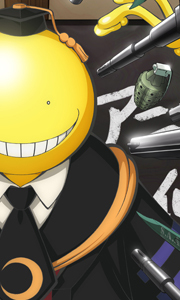 One student's true intentions come out and unveil an unexpected link to Koro Sensei, unlocking the secrets of their teacher's past. Koro Sensei's story, his real intentions...what is the truth behind their mission and their teacher? Once ..
Own Assassination Classroom the Movie - 365 Days Time Blu-Ray + DVD from Deff, DVD, Blu-Ray & 4K Video Specialists - Free UK Delivery..